Yup – that’s me on this page. Sadly not the pretty thing in the middle, but the old blob on the left wearing a grey cardie. 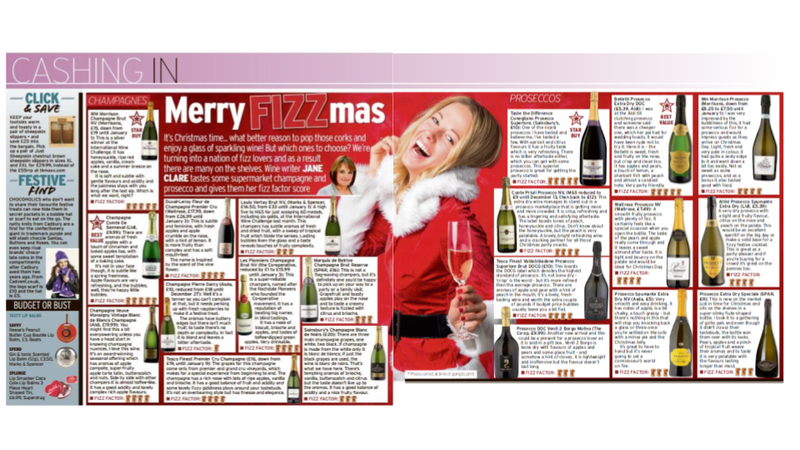 You’ll see we ran a fizz taste test … here’s the supermarket prosecco ratings if you’re making a last-minute dash to the shops for the sprouts and the bread sauce. Or tuck these ideas behind your ear for New Year! Sainsbury’s Taste the Difference Conegliano Prosecco Superiore, (£10) One of the nicest proseccos I have tasted and believe me, I’ve tasted a few. With apricot and citrus flavours it has a fruity taste which is very refreshing. There is no bitter after taste either which you can get with some proseccos. This superior-style prosecco is great for getting the party started. Belletti Prosecco Extra Dry DOC (£5.39, Aldi) I was at the Aldi till clutching prosecco and someone said there was a cheaper one, which her pal had for wedding toasts. It would have been rude not to try it. Here it is – the Belletti is sweet, fresh and fruity on the nose, but crisp and clean too. It has apples and pears, a touch of lemon, a sherbert flirt with peach and almost a candied note.Very party friendly. Wm Morrison Prosecco (Morrisons, down from £8.25 to £7.50 until January 1st) I was very impressed by the bubbliness of this, it had some serious fizz for a prosecco and would impress guests as they arrive on Christmas Day. Light, fresh and very pale in colour, it had quite a zesty edge to it and went down a bit too easily. Not as sweet as some proseccos, and as a bonus it also tasted good with food. Conte Priuli Prosecco NV, (M&S, £12)This extra dry wine manages to stand out in a prosecco marketplace that is getting more and more crowded. It is crisp, refreshing and has a lingering and satisfying after taste. The label boasts tones of peach, honeysuckle and citrus. Don’t know about the honeysuckle, but the peach is very palatable. A lovely, bright refreshing wine and a cracking partner for all those Christmas party snacks. Waitrose Prosecco NV (Waitrose, £7.49) A smooth fruity prosecco with plenty of fizz. It certainly feels like a special occasion when you open the bottle. The taste of the pears and apple really come through and it leaves a sweet almond after-taste. It is light and bouncy on the palate and would be ideal for Christmas Day. Allini Prosecco Spumante Extra Dry (Lidl, £5.39) A very dry prosecco with a light and fruity flavour, citrus on the nose and peach on the palette. This would be an excellent aperitif on the big day or make a solid base for a fizzy festive cocktail. This is great as a party-pleaser and if you’re buying for a crowd it’s great on the pennies too. Tesco Finest Valdobbiadene Prosecco Superiore Brut DOCG (£10) This boasts the DOCG label which denotes the highest standard of prosecco. 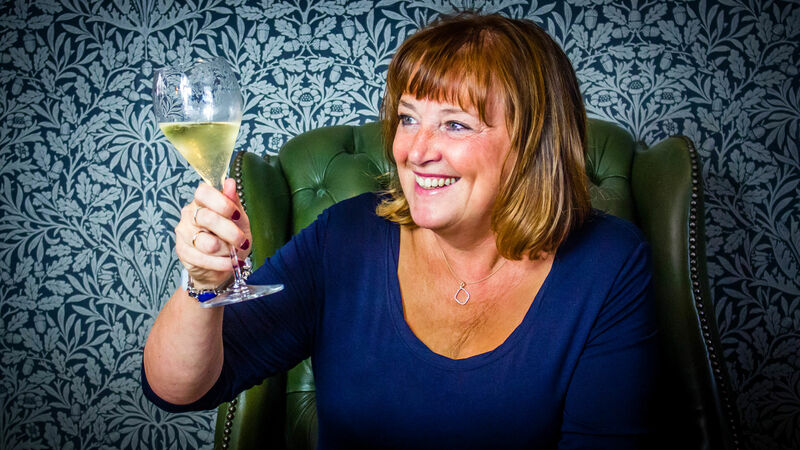 It’s not bone dry – ‘crisp’ is the word – but it’s more refined than the average prosecco. There are aromas of apple and pear with a hint of peach in the mouth. It’s a lively, fresh-tasting wine and worth the extra couple of pounds if budget price bubbles usually leave you a bit flat. Prosecco Extra Dry Speciale (SPAR, £9) This is new on the market just in time for Christmas and sits on the shelves in a super-slinky flute-shaped bottle. I took it to a gathering of girlie pals and even though it didn’t zizazz their tastebuds, the bottle won them over with its looks. Pears, apples and a pinch of tropical fruit weave their aromas and to taste it is very palatable with the flavours lasting longer than most. Prosecco DOC Venti 2 Borgo Molino (The Co-op, £9.99) Another new arrival and this could be a present for a prosecco lover as it is sold in a gift box. Venti 2 Borgo is bone dry with flavours of apples and pears and some glace fruit – and somehow a hint of cloves. It is lightweight and inoffensive but the flavour doesn’t last a great amount of time. Prosecco Spumante Extra Dry NV (Asda, £5) Very smooth and easy drinking. It has notes of apple, is a bit chalky, a touch grassy – but there’s nothing in this that will stop you knocking back a glass or three once you’re settled with a mince pie and the Christmas telly. As with most other proseccos, it’s great to have to hand but it’s never going to set a connoisseur’s world on fire.